A downed deer can weigh up to 200 pounds depending on where you hunt, and after you’ve shot the deer, you need an easy way to transport it back to your truck. If you’re an avid huntsman but aren’t too keen on the prospect of carrying the deer on your back or having to drag it all the way back to camp, then a hunting game cart might be just the thing you need. The fun doesn’t have to stop after that final shot is fired and with the use of a game cart, removing the big game animals won’t take you hours on end. By using the best game cart for deer, you are essentially lifting the limits to how far you can track the animal because now you can move it over longer distances without straining your back or possibly incurring injury. No more spending money on unnecessary backpacks. You can use your cart to carry all our gear out into the hunting ground easily so that you’re fresh and ready to stalk your prey instead of being out of breath by the time you get there. On the way back, it will do the same job for you, only this time (hopefully) there will be lots of fresh meat on it as well. If you were to decide to set up a deer hide somewhere in the forest, can you imagine trying to haul all that lumber and the tools you’re going to need? A best deer cart would certainly come in handy then, wouldn’t it? They are designed to carry heavy weight, so they’ll handle your lock-on tree stand or your ladder stand and climbing sticks with complete ease. The standard deer carts of today are light-weight and portable. Stored in your truck, they hardly take up any space. They can conveniently fold away, some even have removable wheels, and they are easy to set up when you need them. If you don’t need your cart to carry your gear out into the field, then you can just keep it with the rest of your hunting gear and quickly set it up when you need it. If you’re hunting over certain kinds of terrain where it’s just not possible to get an ATV or a truck across to the area where you’ve made the kill, these hunting carts can come in very handy. Also, with some of the laws that prohibit the use of ATVs in certain areas, you will need to have a hunting game cart with you as an option for just such a situation. If anyone in your hunting party should somehow get hurt, this cart can be used to wheel the injured person and get them to safety and help. In certain situations, it could even be life-saving. 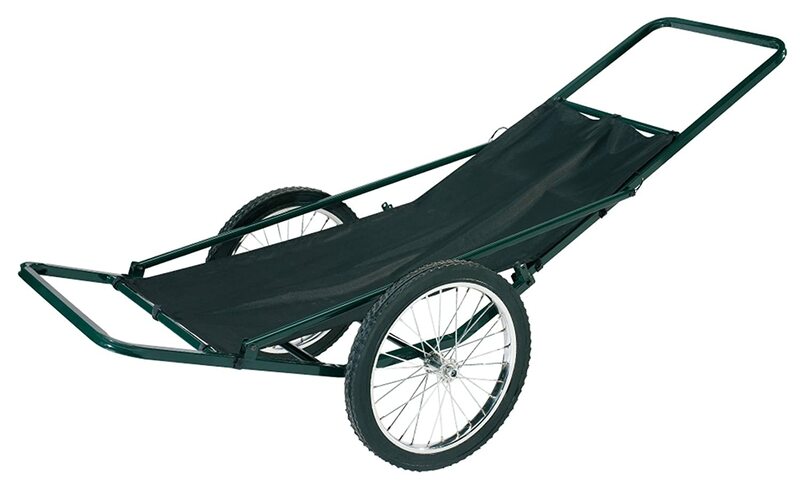 This is a high-quality deer cart from Leader Accessories that has a lot of positive reviews from happy customers. For hunters who know what they want in a cart, this may just be the thing for you. It comes with a host of wonderful features including a strong, heavy duty steel construction for easy toting of heavy loads. The wheel rims and spokes are also made of steel and will resist damage even on rough terrains under heavy load. 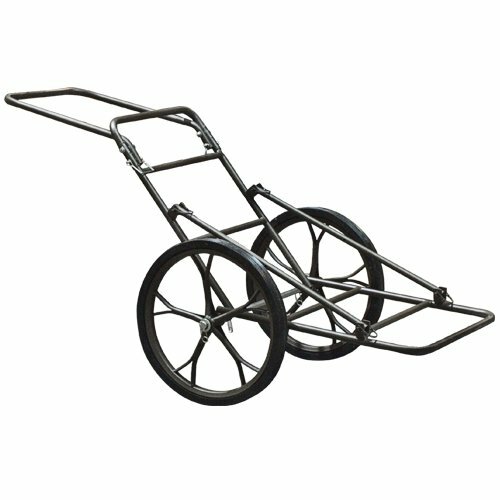 The wheels on the cart are puncture proof and are therefore ideal for rolling over any kind of terrain. This cart comes with a tarp which can be unsnapped whenever you’re loading something that is very heavy. It is extremely portable and, in spite of its strength, this cart is simple to fold for easy storage. It takes up so little space you’ll be amazed. It can actually be folded down to a really small size of just 56.5” length and 29” width. When it comes to strength, portability, and size, this cart takes the crown in our list as the best game cart for deer, although we should mention that if you stop for a minute to catch your breath, sometimes it can be a problem to lift the cart back up to the pulling position. Other than that, we have only great things to say about this carIts puncture-proof tires make it ideal for rough hunting terrain. If the first entry on our list was there because it had a lot of great features, this cart certainly is a serious contender for that spot. The Guide Gear Aluminum Deer Cart is balanced and as strong as they come. You’ll be able to haul your deer home with a lot of ease, and your back will thank you for it. It folds as flat as a pancake in just seconds to fit in your truck or to store it away for your next hunt. Every experienced hunter will tell you just how much of a difference the weight and strength of a game cart can make the ease with which you get your downed deer back to your car. Those days have gone, when you had to sacrifice your back for the sake of getting your trophy home. This cart rolls easily and comes with completely puncture-proof wheels to make light of the journey over rough terrain. Use the light-weight Guide Gear Aluminum Deer Cart to carry not just your trophy, but your supplies like bait and hunting equipment as well. The cart comes with straps that have plastic buckles, but this isn’t necessarily a bad thing as they are strong and rust-free. Of course, being plastic, they are also susceptible to breaking under extreme pressure so care has to be exercised when securing them. Although this makes a great elk game cart, we are a bit concerned about some of the parts that may have to be replaced after the first or second usage. All in all, this is a good cart with great features, and as long as you won’t try to carry a moose in it, it will perform great for your next hunt. This cart has a weight-carrying capacity of 500 lbs. This means that it’s strong enough to comfortably hold a large deer. Its wheels have a diameter of about 17” making it both well balanced and stable. The cart tires are made from a high-quality rubber which is about 37mm thick, and they are ideal for gripping any surface more securely. The cart comes with an instruction manual to help you put it together quickly and easily, as well as to help you get the most usage out of your cart. For easy storage, the Goplus Deer Game Cart folds into a smaller size, though it may still take up a little more space than the other carts on this list due to its bigger size. This is a very high-quality cart at a low price that is totally worth buying. You will be glad you did on your next hunt when it makes easy work of hauling your trophy. The heavy-duty steel construction of this cart makes it much stronger than many others on the market and even more durable. This cart’s dimensions ensure that you will have enough space to carry your deer as well as your equipment back to camp easily. The two included straps make it easy to securely fix your trophy onto the cart, and the cart folds in seconds for easy storage in your car. 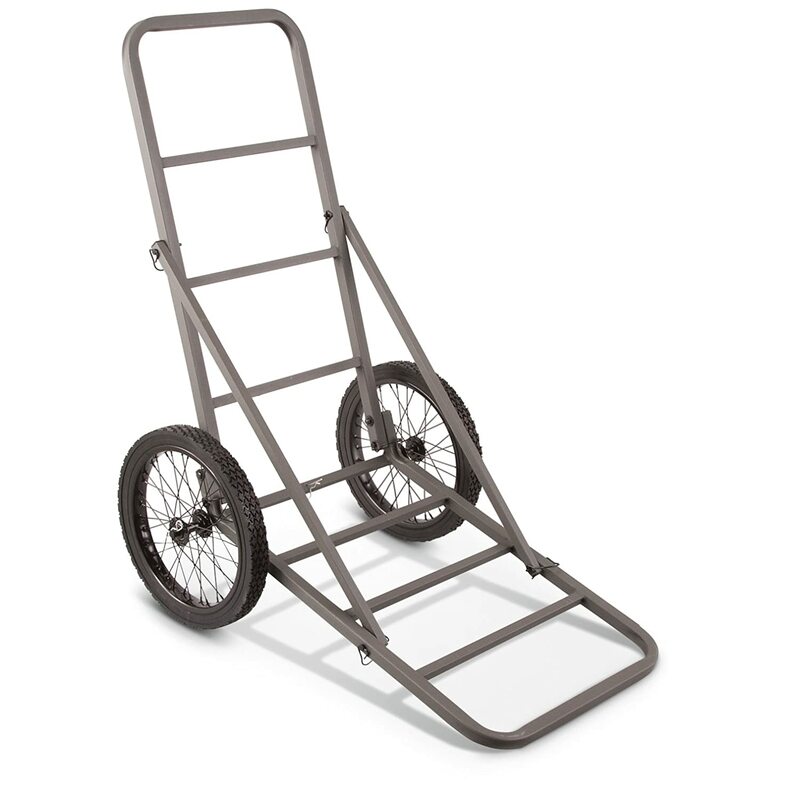 Although this cart is one of the best deer carts we’ve reviewed, the washers for the axles can be a little bigger than the axle size and men of above-average height may find the handle a bit uncomfortable to use. This popular cart has a weight capacity that isn’t as impressive as the other carts. It only takes 250 pounds of weight, but what it lacks in load-bearing capacity it more than makes up for in other features. 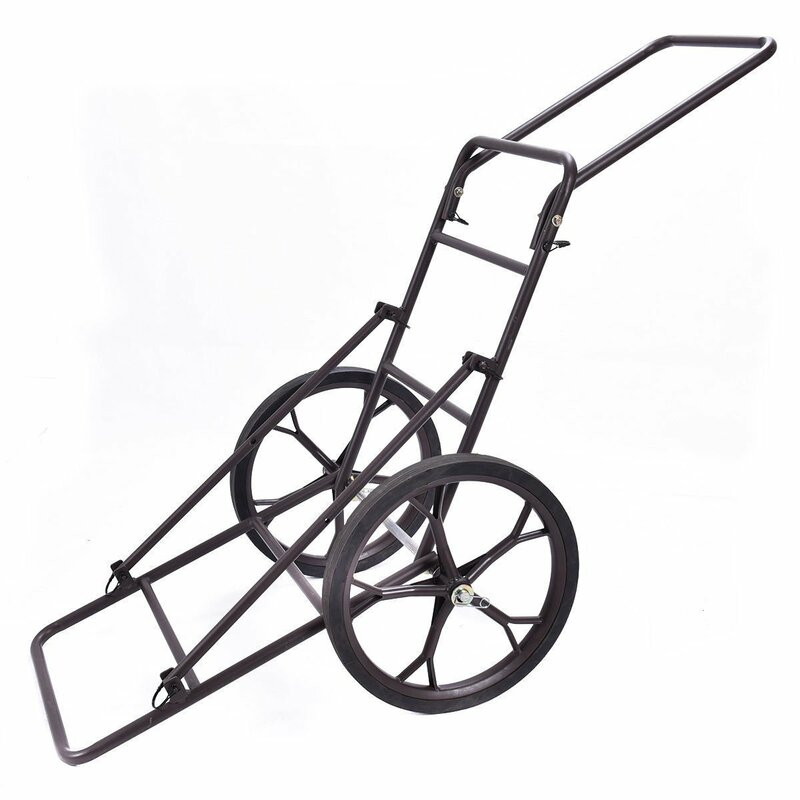 The Guide Gear Deer Cart has a frame that is made entirely of solid steel. This makes it strong, tough and durable and ensures that it will last you a long time. In addition to this, the wheel diameter of 15” means that this cart has a great balance. You won’t have to struggle and suffer to pull this cart. The tires are made from a rugged rubber material that can withstand various terrains and has a sure grip on any surface you roll it over. Although it doesn’t really look like much, when it comes to performance, this cart beats a lot of carts that can take a load weighing twice the amount this one can. Depending on where you do most of your hunting, and how large you expect your prize to be, this may be just the perfect cart for your hunting needs. On the flip side, the cart is straight up and doesn’t come with a slanted handle for pushing it. This means that you may start to feel some strain after pushing it for a while. Summit Treestands has always produced high-quality gear and this game cart is one such product from this top-notch brand. This cart was designed to easily carry your trophy, no matter how large it is. It was built with durable materials to ensure long-lasting performance. This cart can take a beating and keep on rolling. The handle is really comfortable and the cart has 3 straps for secure fitting that are strong and tough. They will keep your prize in place no matter how much it weighs. As long as it fits in the cart, it will be safe in the cart. The cart comes with rubber wheels measuring 16” in diameter and it rolls smoothly through uneven ground. Its curved handle makes easy work of rolling heavy loads by giving you different places to position your hands so as to minimize strain on your wrists, arms, and back. As with most of the other contenders for the title of Best Game Cart for Deer, this cart easily folds for convenient storage. Its wheels even come off to make this easier. On the other side of the coin, this cart is a little heavier than the others on our list and when it’s new, the tires have an annoying smell, but luckily it goes away over time. A great thing that you will notice about Summit is that they don’t charge an arm and a leg even though their gear is all high quality. This is refreshingly different from other premium brands. The only thing that would make this product even better would be a higher load capacity. The handle for this cart is designed at an angle, which makes it great because it keeps your wrists straight. When your wrists are straight it decreases the amount of pressure and strain that they experience meaning that you can push for longer distances without tiring. 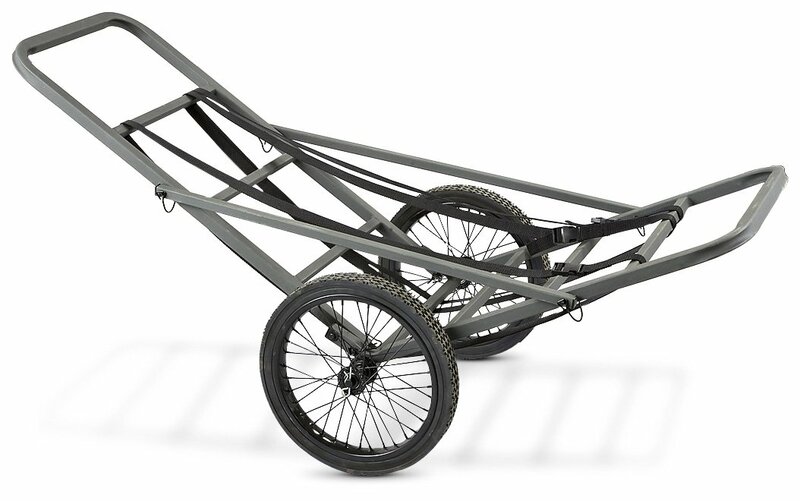 This entire cart frame, including the axle, is constructed from steel, making it strong and durable. 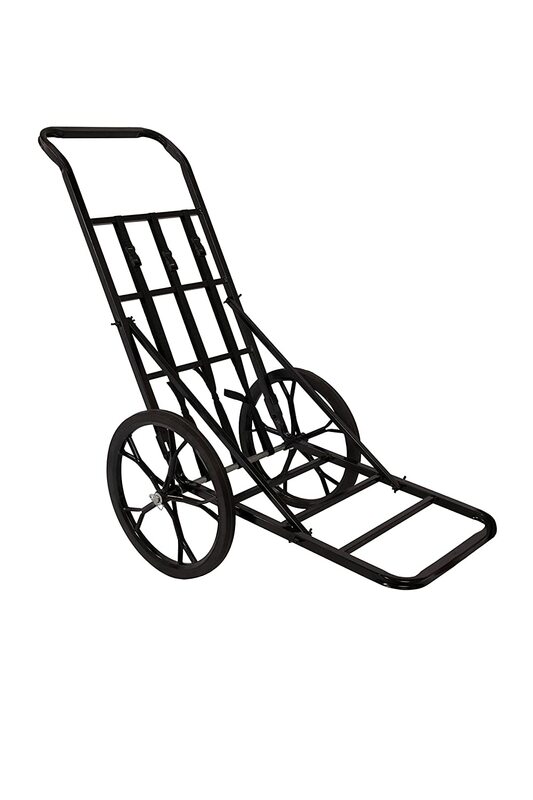 This cart from Best Choice Products can carry a maximum weight load of 500 pounds. This should be plenty enough for most hunters unless you are downing a moose! The large wheels and durable construction of this cart are exactly what you need when you’re getting ready to haul your prize back home. The cart tires are made from thick, solid rubber that will never go flat and the tread on the tires ensures that they provide a firm grip on any kind of surface even when the cart is fully loaded. You can easily fold this cart in a few seconds for convenient storage. The wheels even come off to make the cart even smaller when you store it. The cart comes with two buckle straps to make transporting your carcass easy and secure. You just strap it on, and you’re good to go! There’s no need for constant adjustment. If you’ve ever had to drag your downed deer back to camp without the use of a game cart, then you will appreciate how easy this cart makes that whole process. If you’re planning on hunting prey that is under 500 pounds, then this best deer cart from XtremepowerUS will serve you well. It’s designed to not only carry heavy loads but also to be durable and long-lasting. In addition to its heavy-duty steel make, it comes with other great features including removable wheels for compact storage. This means that it will serve you well on the field by carrying everything including your hunting gear, bait, and other equipment, but when it’s time to head home, it will quickly and easily fold and tuck out of the way, making space for your trophy in your truck. Although this cart is tough and rugged, it’s also surprisingly light-weight in nature, making it easy to carry up to the field if you choose to do so. The tires do come with a really strong smell that could be offensive to some people, but luckily it fades over time and with use so you won’t have to put up with it for very long. The wheels on the cart that you ultimately choose to go with need to be of the large, durable kind that will perform well over all kinds of rugged terrain. The last thing you want is to be stuck in the middle of the forest with a fully laden cart just because your wheels failed to perform over bumpy or uneven ground. 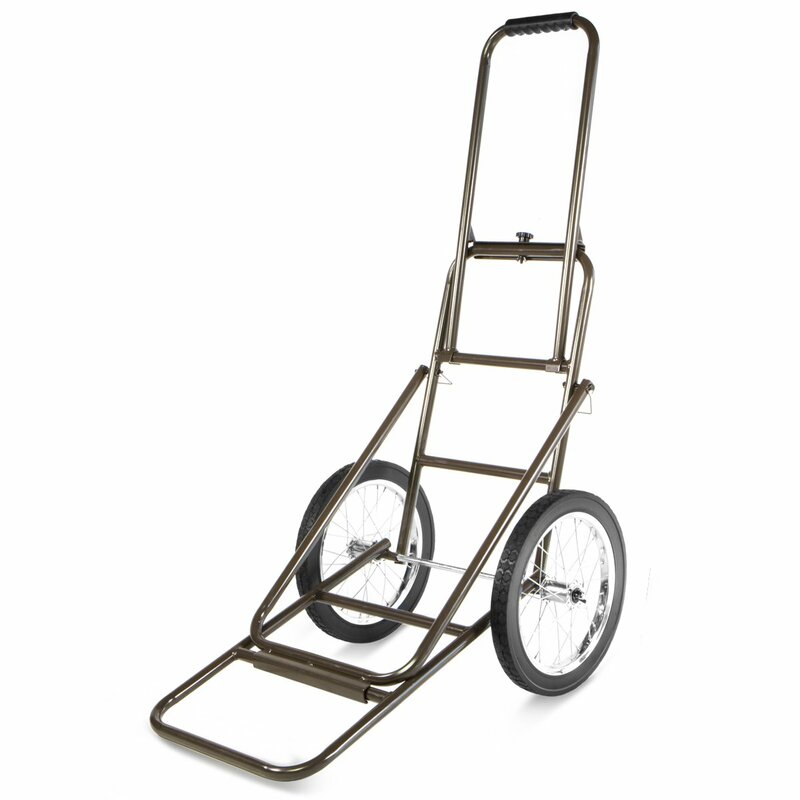 Choose a cart with large wheels that have hard rubber tires which are puncture-proof. Most game carts weigh in at about 30 pounds. Some are lighter and some are heavier, but you need to consider the kind of weight that you will be hauling with your carrier. As a general rule, some of the lighter models have less weight-carrying capacity as opposed to their counterparts with heavier frames. Choose a cart based on what size deer, (or how many of them) you’d like to transport. This is one of the most important considerations when selecting the best game cart to buy. Obviously, you should go for a frame with strong construction like solid steel. This ensures that your frame will be durable and strong and last you a long time. You don’t want to have to buy a new frame every time you’re leaving for a hunt, do you? Also, check to make sure that your frame’s finish is appropriate for the weather conditions where you will be hunting. Some frames fold away in two parts while others do so in three. Each of these has their own advantages. If you’re going to be using your cart to haul a lot of equipment or a tree stand, you may want a cart that is more flexible like the three-part cart, but if you just want it for the downed game, then you could go with the two-part one. Either way, ensure that your cart is easy to fold into a smaller size for compact storage. A lot of the best deer carts on the market right now are super easy to set up and don’t require specialized tools and in many cases, they don’t require any tools at all. The more complicated ones may take a bit of time to figure out how to assemble, and so while making your decision on which cart may be the best one for you, consider how easy it will be to put it together. Most deer carts come with some kind of strapping mechanism to make it easier and more secure when you’re transporting your prize back to camp, but some straps are stronger and more durable than others. Some carts will have standard lashing straps while others have straps with buckles for that extra security to keep your equipment or your trophy from toppling off the cart on your way back. The foldable deer cart is the most popular and widely used cart among deer hunters with good reason. It makes it easy to transport both your equipment and supplies to the hunting ground and your downed deer back to camp. After you’ve finished using it, it folds up small and compact for easy storage until your next hunt. The cart is versatile and can be used to carry camping equipment, sacks of bait, or even another injured hunter, in case of emergency. With all those uses for such a small, affordable price, there is no reason to leave for your next hunt without one of these deer carts.